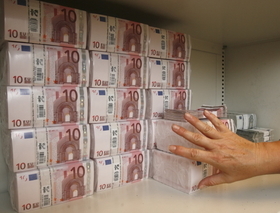 About 20% of German auto executives are getting their hands on fewer euros than in the past. FRANKFURT (Reuters) -- Almost half of Germany's car industry executives had to take pay cuts as a result of the economic crisis, more than in any other industry, a study shows. Overall, almost one in five managers had lower pay than before the crisis, according to a survey of 91,000 executives from lower, middle and top levels of hierarchy in various German sectors by Manager Magazin and social networking site XING. Still, automakers' top-level executives earned an average 168,000 euros ($247,400) per year, more than their counterparts in the finance, chemicals and drugs, retail and wholesale, IT, consumer staples and engineering industries, according to the survey. The average compensation package of survey participants was worth 82,000 euros, and 7 percent made more than 110,000 euros per year. Executives in the top echelon made about twice as much as bottom-level subordinates, the survey showed. Male executives took home 27 percent more than their female colleagues but the gender gap has all but disappeared in spheres beyond 110,000 euros per annum, Manager Magazin said. Out of all industries, IT and technology companies put men and woman on a particularly equal footing, it added. The average total compensation package among the 30 chiefs of benchmark DAX companies slid to 2.28 million euros last year, DSW said.